Which is better? Fry, bake, and decide. Intellectual arguments aside, the aesthetic pleasures of the two foods—when prepared traditionally—seem uneven at best. 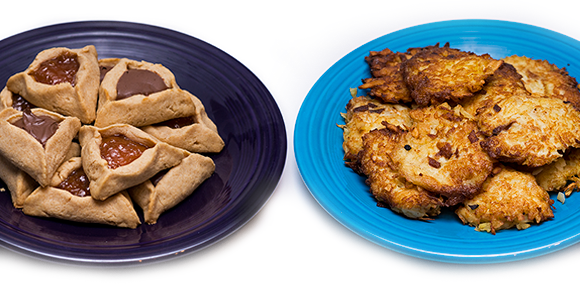 Hamantashen are often made with oil or vegetable shortening so they are pareve, and can therefore be eaten with either meat or dairy by those keeping kosher. Traditional fillings are poppy seeds or prune butter. Prune butter? My favorite! So here we offer a recipe that seems more fair to the hamantash: one with ample amounts of butter as well as fillings available in the age of globalization and refrigeration. Beat the eggs in a small bowl. In a medium bowl, stir together the grated potatoes, crackers, onion, and salt, then add the beaten eggs. Pour the oil 1/4-inch deep in a large skillet. Heat the pan over medium-high heat until the oil bubbles when a little piece of potato is dropped in. Drop a tablespoon of batter into the oil; two or three latkes will fit into the pan at once. Cook until golden on the bottom, 2–3 minutes, then flip and cook 2–3 minutes on the other side. Drain on paper towels. Serve with sour cream (or plain yogurt), applesauce, or both. Adapted from 1,000 Vegetarian Recipes by Carol Gelles (1996). In a large mixing bowl, cream together the butter and sugar until smooth. Beat in the eggs, then stir in the orange juice, vanilla, and baking powder. Gradually stir in the flour until the dough forms a ball. Cover and refrigerate for 2 hours. Preheat the oven to 375 degrees F. On a lightly floured surface, roll the dough out to 1/4-inch thickness. Cut into 3-inch circles using a cookie cutter or small glass. Place circles on greased or nonstick cookie sheets. Spoon 1 teaspoon of filling into the center of each circle. Pinch the sides of each circle to form a triangle, letting the filling show in the middle. Bake 8 to 10 minutes until light golden brown.